Tools is a menu tab in the WordPress admin sidebar. It contains tools to perform some non-routine management tasks. With every installation of WordPress there are three options. The first is “Available Tools”. Under this section there is a bookmarklet called Press This that allows quick posting and publishing by means of using a a browser favorite button. 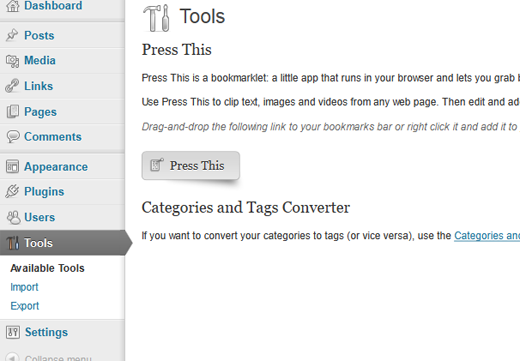 Immediately beneath that there is a categories to tags converter script that will take you to the Tools Import Screen. If you look back at the tools drop down menu, then you will see the Import and Export tabs immediately beneath the Available Tools tab. 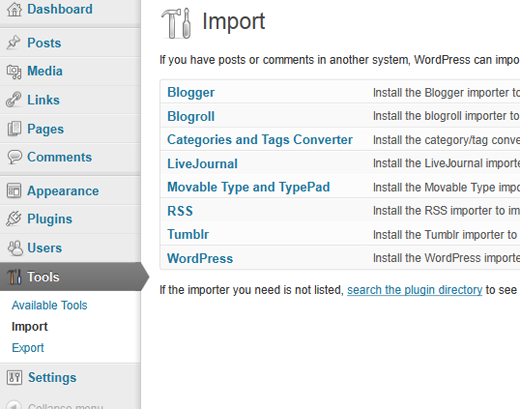 These import and export tools allow WordPress to import and export data to and from other content management systems. The import tool contains scripts to import data from other Content Management Systems into WordPress. If you have a website on Blogger, Movable Type, or even another WordPress site then you can install any of the scripts that you need on this page. These scripts will allow you to import your content from whatever content management system you specified. As was mentioned earlier, the other script you will find on this page is the categories to tags converter script. The export tool allows users to export WordPress data in XML format which can later be imported into another WordPress installation. The format is called a WordPress eXtended RSS or WXR file. It will contain all of your posts, comments, custom fields, categories, and tags. Exporting your content is a useful way to back up your WordPress website.